Sheena later bloated even though she wasn't particularly deep-chested. If you have a deep-chested, long-bodied, flat-ribbed dog of a large breed that is approaching middle age, then you have a candidate for the life-threatening emergency known as bloat or gastric torsion. If it strikes, you have a few hours to get that dog into surgery to save its life. 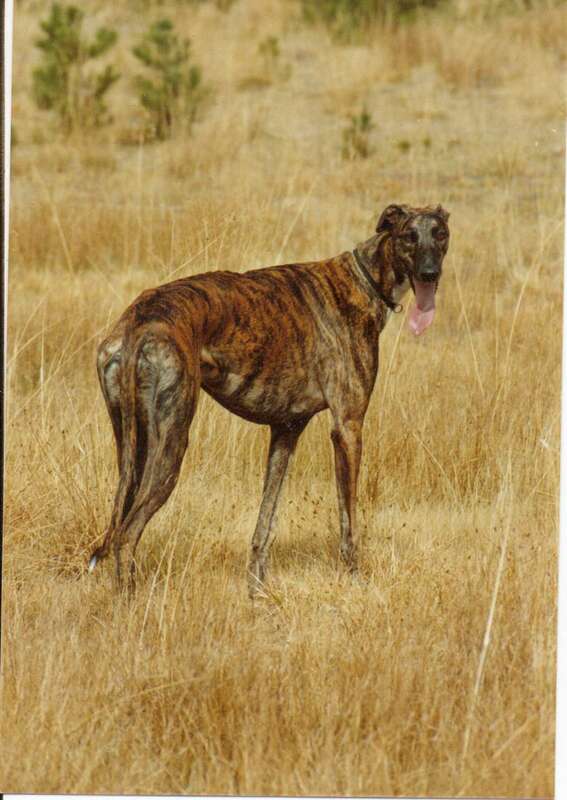 It strikes without warning and it strikes breeds as diverse as Irish Wolfhounds, Doberman Pinschers, Irish Setters, Greyhounds, Borzoi, Great Danes, Standard Poodles and German Shepherd, plus a host of others. It occurs in all of the medium to large breeds and is more common in older dogs than in younger. That has never been determined. Some foods have been blamed. Exercising on a full stomach has been blamed. So has stress and heredity. These all may be causes. It is sensible precaution to pre-soak kibble and to feed twice or more often a day and to restrict exercise after eating. Even so we get bloat. Gastric torsion means that the stomach has rotated 180 or 360 degrees. When it rotates, the entrance and exit of the stomach are sealed and gasses in the stomach expand, causing the stomach to swell and eventually to burst in a matter of hours. This swelling is called bloat. It is also possible to bloat without having the stomach torsion. When there is bloat without torsion a tube can be passed into the stomach to relieve the pressure and to stabilize the dog without surgery. If torsion has occurred, then surgery is the only hope for saving the dog. If the torsion is only 180 degrees, it is usually possible to pass a stomach tube, but surgery will still be needed. The spleen is often involved in torsion. One theory of torsion says that the spleen torsions first, becomes engorged with blood, enlarges and then pulls the stomach over. A friend with a nine-year old Dual Champion Irish Setter took him in for bloat recently and was told that his spleen had torsioned but his stomach had not, so they removed the spleen and tacked his stomach in place. Perhaps an account of my most recent brush with torsion may be of help to folks who have not yet encountered it. Also, there is a new and improved surgical technique for treating it which was used on both Sheena (a greyhound) and the Irish setter. Sheena is approaching her seventh birthday. She had been living on a diet of boiled rice and ground lamb for six months and was fed twice a day. She had recently developed a taste for my dog’s Prescription Diet KD kibble, so I was adding that to her diet, soaked and pre-expanded. On December 28th I fed the dogs at 6:30 PM and left to celebrate my birthday at an ice-skating show. She had eaten well. When I returned home at 11:00 PM she looked pregnant. She had a new pot belly. I called the emergency number at my vet, told them I would be there in forty minutes with a Greyhound with bloat and loaded her in the car. Hint #1: When you park you car at night, make sure it has enough gas to reach your vet. I have been doing this for years to be ready for the midnight trips to the vet. The middle of the night is no time to be searching for an open gas station with a sick dog along for the ride. The vet on duty when we arrived didn’t think Sheena looked bad. She said she was used to seeing bloat cases that had swelled up like balloons. She took an X-ray, pointed out the stomach distension and gas in the intestines and said she wanted to tube Sheena and if all did not go well she would call the main surgeon and have him come in. That made me feel a lot better. I had known Dr. Schenck for fourteen years and I knew that he did not expect to lose a bloat case unless the owner was so slow in bringing it to the office that too much damage had occurred before the dog reached him. One of my nightmares is to present a bloat case at a night clinic and have surgery proposed at the hands of a vet I know nothing about. Most vets seem willing to try bloat surgery. But what you want is a vet with a history of having his patients survive. At 3:00 AM Dr. Schenck was called in and saw immediately in the X-ray what the first vet and I had missed. It is something that you might look for on a bloat X-ray. The entrance and the exit to the stomach were both pinned up against the backbone, which meant that the stomach was twisted 180 degrees. The spine is supposed to be on the opposite side of the stomach from the connection to the intestine. Had we been able to read the X-ray the way he did, he would have been called for surgery immediately. There had been no point in taking the time to tube her. With the 180 degree twist she could be successfully tubed but would bloat again as soon as the tube was removed. Dr. Schenck complimented me a lot on getting Sheena in early, saying that he often saw dogs whose stomachs were black from lack of blood circulation when he opened them up, but Sheena’s had been nice and pink. When the stomach torsions it cuts off its own blood supply which is why it turns black. It also builds up toxins. This is the reason that dogs often die of heart problems following bloat surgery. When the stomach is untwisted and blood flows through it again, all the toxins it has built up are flushed into the blood stream. And when these reach the heart they disturb the rhythmic beating and cause arrhythmia. Ch. Claridge Starbuck was found dead in his kennel a few days after bloat surgery. At that time it was thought ha had a blood clot, but in retrospect is seems that he probably died from heart arrhythmia. Sheena stayed at the vet with her heart being monitored for two days after the surgery. When she came home, she had an incision from her breast bone to her groin, more stitches than I have seen in a dog and her whole abdomenal area was black and blue. Since her insides had been handled a lot, she was on heavy antibiotics for three weeks. Thirty-six hours after she came home, she did have a couple of attacks of wheezing that resembled what I have seem of arrhythmias, but they passed. Hint #2: Get bloat victims to the vet immediately, before the stomach loses too much blood circulation. This is not time to wait and see. The vet gave Sheena back to me with instructions to feed her small frequent amounts, but she had little appetite. The first night I got her to eat some cereal and cream and sugar. The next morning I scrambled an egg with a little rice. She tried to bury her normal boiled lamb and rice, so I returned to the vet and asked for a case of Prescription Diet ID (Intestinal Diet). She loved it. So did fourteen year old Lady. They shared food for the couple of weeks that it took to reintroduce boiled rice and ground meat. Hint #3: When you take a bloat victim home, take along a case of ID. It will save you from making the extra trip later. Dr. Schenck said that Sheena would be moderately healed in a week of restricted activity and quite well healed in two weeks. A lot of credit for Sheena’s recovery goes to her early treatment, a talented vet, and to Sheena herself. She is indomitable. I have seen dogs that were pitiful in the discomfort of torsion. Sheena tried to pretend the whole time that nothing was wrong with her, and it was a joy to have her home acting like her old bossy self and then curling up on the daybed next to me to watch TV. Those two night without Sheena were tough. I nagged her brother into taking her place on the bed, but he would wait until I fell asleep and then escape. After all, that was Sheena’s space. When I picked her up at the vet she had just been taken off the IV’s. IV solutions are fill of glucose which raises the blood sugar. Until that burned out of her system she was wide-eyed, pacing and nervous. The first night she kept moving restlessly and I kept worrying for fear something was wrong, but as soon as her blood sugar normalized she was back to her old self. If you ever encounter torsion, keep calm. This is very scary to deal with. It puts life and death on the line without warning. Good luck.